The Pentagon Renovation Project Program involves the complete gutting and reconstruction of the entire building in phases to bring the building into compliance with modern building, life safety, ADA and fire codes. The program was on an accelerated schedule for completion in December 2010, four years sooner than originally planned. JL fire extinguisher cabinets were specified and installed throughout the current section undergoing renovation. 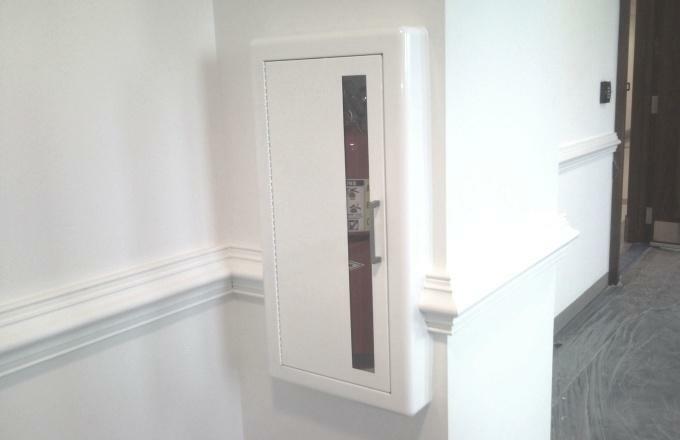 The Ambassador 3016V10 and 3017V10 provide ADA‐compliant recessed cabinets in neutral white powder‐coat painted steel with vertical view windows for visual checking of fire extinguishers. View Product Page.